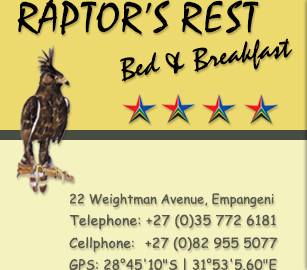 Raptor's Rest is located at 22 Weightman Avenue in Empangeni, KwaZulu-Natal. GPS co-ordinates: 28�'10"S | 31�'5.60"E. Please click here for the map or to view our location on Google Maps. Zululand, the place of the people of the heavens, is a land that offers a great diversity of activities such as game viewing, hunting, wilderness adventures, snorkelling or scuba diving, canoeing, boardsailing, peaceful lake fishing and thrilling big game fishing, hiking or visiting museums, monuments and historical sites. Situated on the east coast of Southern Africa, it forms the northern part of KwaZulu-Natal, one of the nine provinces of South Africa. This corner of the African continent is a land of exquisite beauty. On its eastern boundary its golden shores are caressed by the warm waters of the Indian Ocean. The coastline stretches some three hundred and fifty kilometres from the mouth of the mighty Tugela River in the south to the Mozambique border in the north. The coastal plains include endless unspoilt beaches and coastal conservation areas and incorporate the largest estuarine system in Southern Africa. Inland to the west is a place of endless rolling hills and meandering valleys, grassy plains and dense bush. Forest sanctuaries, reserves and misty mountain peaks create an atmosphere of peace and tranquillity. Here echoes of the past are a reminder of the rich history of Zululand which has included the establishment, growth and development of one of the great nations of Africa, the amaZulu. This land has witnessed one of the greatest challenges to the supremacy of the once mighty British Empire during the tragic but heroic days of the Anglo-Zulu War. It is also steeped in the fascinating culture of the people who call it home. Rich in symbolism and tradition, here the heartbeat of Africa throbs with an almost mystic vitality. Zululand is also home to an astonishing variety of wild game. The many game reserves, parks and farms in the region are dedicated to the conservation and heritage of wildlife preservation. In all Africa there are few regions so richly endowed with the spectrum of wildlife which is found here. From the "Big 5", which include elephant, lion, rhino, leopard and buffalo, to the prehistoric crocodile and leatherback turtles, Zululand has them all and many more. The birdlife is equally varied with over 360 species making the region a bird-watchers paradise. For the tourist hoping to discover the earthy heart of Africa and taste its multitude of exotic flavours, a visit to Zululand is a comprehensive way. There is no other place that offers so complete an African experience. Travellers too will find great delight in passing through Zululand. 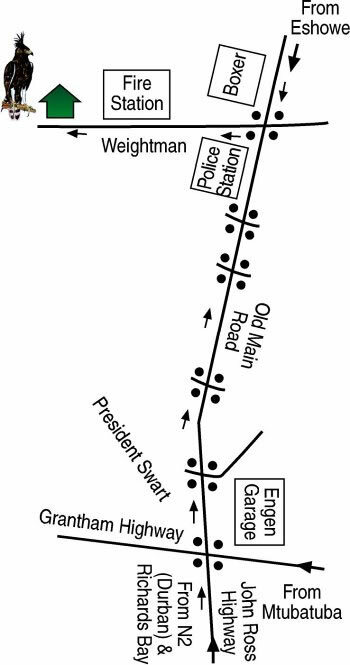 Unknown to many, it offers an alternative route to reach Durban for those travelling from Johannesburg to the hinterland or vice versa. The main roads are well maintained, the scenery is delightful and there are wonderful opportunities for on route stopovers or journey breaks. The variety of accommodation available in the region is also geared to suite all tastes and levels of affordability. From impressive hotel or sumptuous game lodge style luxury to delightful inns, country lodges and bed-and-breakfast hideaways, the range is remarkable. For those wanting a true traditional African experience you can stay overnight in authentic Zulu huts. Fishing off the coastRustic and homely self-catering establishments, camp sites and caravan parks complete the picture. Although the larger Game Reserves are under the control of the Natal Parks Board and the KwaZulu Department of Nature Conservation, there is a wide range of exclusive private reserves and ranches to pamper you in royal comfort and secluded privacy. It is well worth remembering that during peak seasons it is necessary to book in advance in the more popular reserves and resorts. As a holiday destination Zululand provides an ideal escape from the pressures and stresses of mainstream existence. Whatever your thoughts for the ideal way to relax and spend your leisure time, you will be amply provided for. Leave behind the glitz and glamour of big city life and allow yourself to be charmed as nature casts its mystic spell over your jaded senses.